Day in and day out I spend most of my time staring at a screen, not because of my age but because of my professions. Working in a pharmacy involves day long computer work, staring at small pills and even smaller font on labels. By the end of the day, or even after about 4 hours, my eyes feel the strain of the day. Being the age that I am and having no vision issues (I’d like to keep it that way) I looked into different options to help prevent eye damage and deterioration. While there were many different options such as computer screen covers, reducing brightness or yellowing the screens, all of this would alter the colours of any graphics or images I may be editing, thus not really an option. Finding a solution I could reverse quickly was key. Glasses, I just have to slide them down to see the true colours of the image. 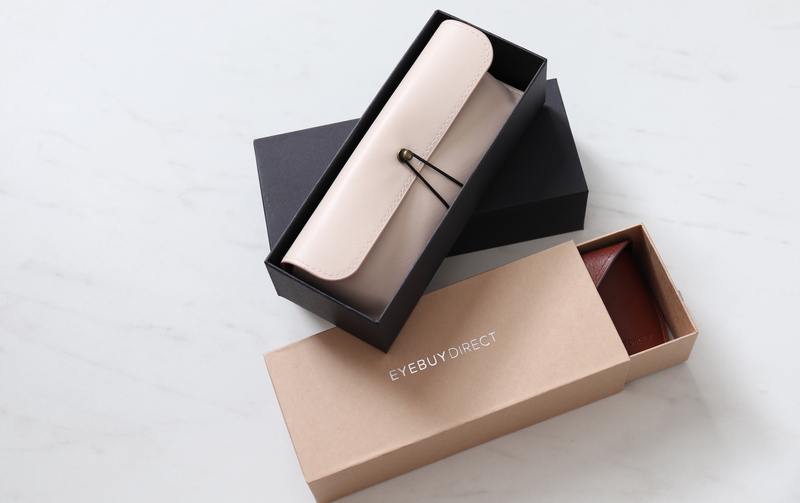 After doing some research I ordered 2 pairs from EyeBuy Direct, an online eyewear retailer that sells prescription/non-prescription glasses and also donates glasses to those who don’t have access to vision care. 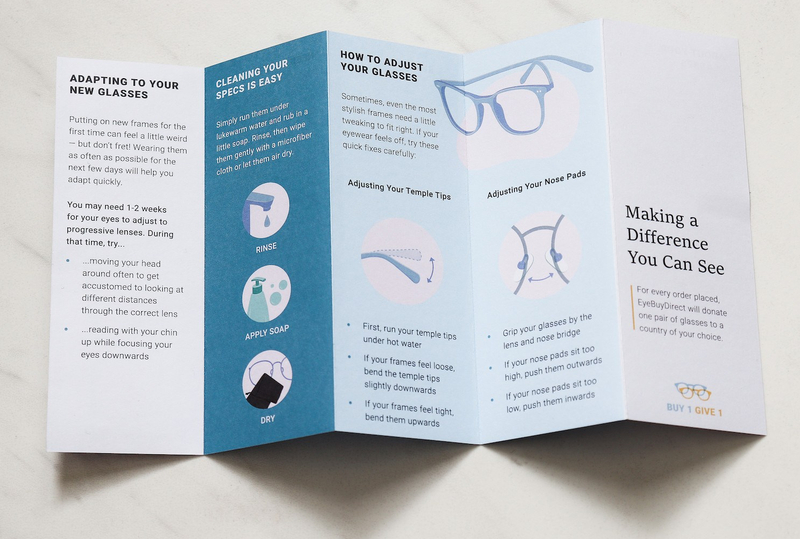 There was also a leaflet (featured below) that accompanied the glasses, it detailed care instructions, how to resize the glasses if needed, and a few other tips and tricks. I ordered the following 2 styles of glasses: Maya & Resonance. 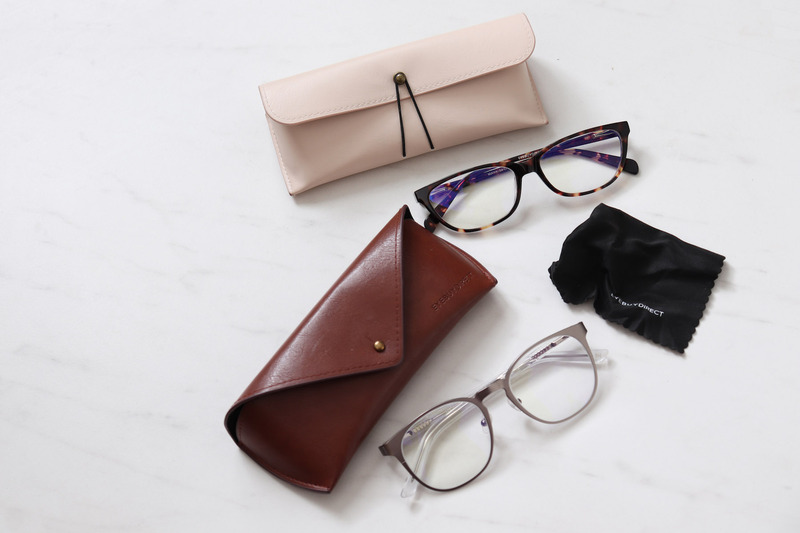 The Maya frame retails for $45 and Resonance retails for $99, the lens I purchased was the Sightrelax lens for $37 and that is described as a “Premium digital screen protection lens, designed to shield your eyes and provide comfort during screen time”. I chose these glasses based on a previous Halloween costume I had worn in grade 11 (I was a librarian/Serena Vanderwoodsen… original I know). I had never worn glasses so I wasn’t really sure what style would work best, but I remembered that darn Halloween costume and receiving many compliments on the eyewear so I gravitated to a similar style. I have an oval face so I prefer a cat eye/winged frame. Resonance isn’t a style I normally gravitate to, squoval frames are something I’m still growing comfortable with. They seem big, don’t they? I feel as though they take up too much real-estate. Also, the model must have a ginormous face to make these glasses look so reasonably sized. Seriously! I have a pretty big face and these still look large on me. Hmm, I’ll let you know how I feel in a few weeks time. I really like these glasses I notice a significant difference in my eyes when I wear them vs. when I don’t. My eyes become very dry during the day (thank you birth control side effects) and wearing these glasses helps to reduce the stress of dryness and blue light exposure. My eyes still become tired but not as quickly, and they still get red, but not as quickly. If I’ve been staring at a screen for a while and put my glasses on I feel instant relief. I sometimes even wear these glasses for driving; I feel as though they help to reduce glare from passing cars, street lights etc. Also, for anyone who normally doesn’t wear glasses they’re a fun accessory, that is when I remember to wear them, that in all honesty is the hardest part. Because I can still see without them, often times I forget to put them on. If you’ve ever considered blue light/computer glasses I hope this sheds some light (sorry dad joke) on whether or not they’re the right investment for you. 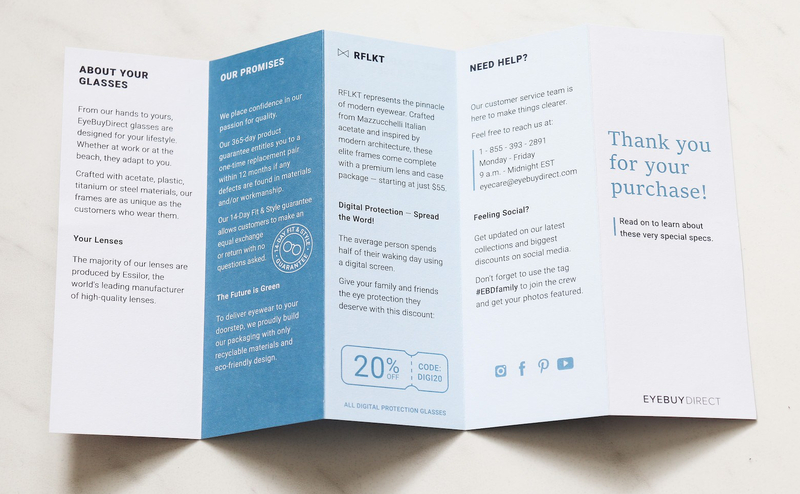 If you decide to purchase feel free to use this link to get $10 off your first order. If you decide to try them let us know. Next Post Dolce & Gabanna DIYs ?